I was sub-contracted to participate in the logo and business card design. PC Med Center also built a webpage and some other branding materials. inspiration // WWII relics: The company buys and sells WWII artifacts, so the logo carries elements from medals and badges, germanic/gothic lettering, and German officers' swords. 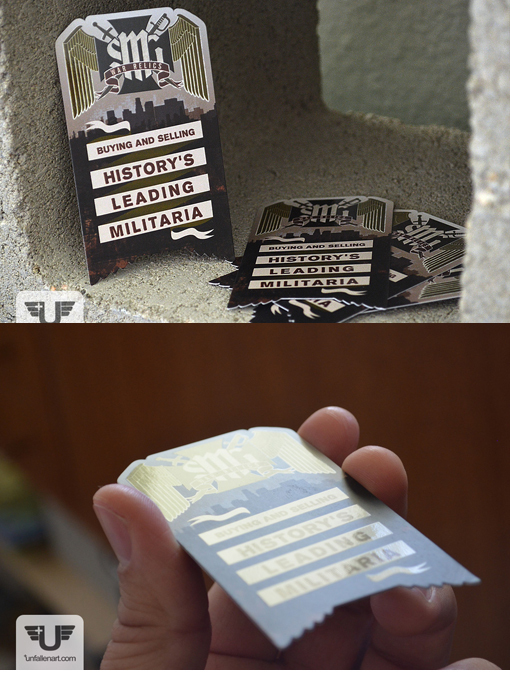 The theme is carried into the card, providing the shape for the die-cut and a grungy city background inspired by an industrial war / grungy dilapidation concept. The banners and logo are a throwback to propaganda of the time as well. features // spot gloss on the banner and logo. die-cut. silk finish. 16pt stock.